Downing Street will not fly the EU flag over Number 10 during Europe Day on Monday unlike previous years, the BBC has learned. 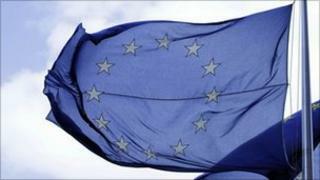 Some other departments, including the Treasury and Foreign Office, will also not hoist the European symbol. But the Liberal Democrat Vince Cable's Department for Business will raise the blue and gold flag. Downing Street denied there had been any instruction from the prime minister to departments to end the tradition. However, Number 10 did hoist the flag last year. The UK's relationship with Europe is a potential source of tension between the Conservative and Liberal Democrat coalition partners. The government's own published guidance still does suggest that departments should mark the day by flying the EU flag. A spokesperson from the Department for Business, Innovation and Skills told the BBC its permanent secretary had taken the decision to fly the flag as in previous years. Meanwhile, the Department of Energy and Climate Change, led by another Liberal Democrat, Chris Huhne, told the BBC it did not have a flagpole.